Brand new pair of polysoft/softline multifilament 3-strand mooring ropes available in navy blue. These pre-made or pre-spliced navy blue mooring ropes are suitable for all boats, yachts and canal narrow boats. Brand new pair of polysoft/softline multifilament 3-strand mooring ropes available in black. These pre-made or pre-spliced black mooring ropes are suitable for all boats, yachts and canal narrow boats. Brand new pair of polysoft/softline multifilament 3-strand mooring ropes available in yellow. 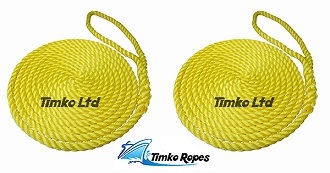 These pre-made or pre-spliced yellow mooring ropes are suitable for all boats, yachts and canal narrow boats. Brand new pair of polysoft/softline multifilament 3-strand mooring ropes available in red. 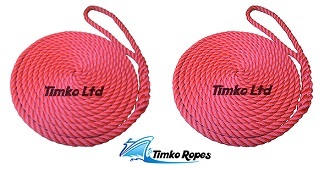 These pre-made or pre-spliced red mooring ropes are suitable for all boats, yachts and canal narrow boats. Brand new pair of polysoft/softline multifilament 3-strand mooring ropes available in white. These pre-made or pre-spliced white mooring ropes are suitable for all boats, yachts and canal narrow boats. Brand new pair of polysoft/softline multifilament 3-strand mooring ropes available in royal blue. 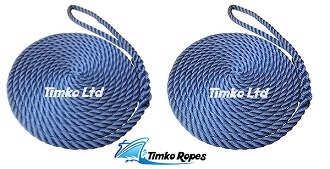 These pre-made or pre-spliced royal blue mooring ropes are suitable for all boats, yachts and canal narrow boats.